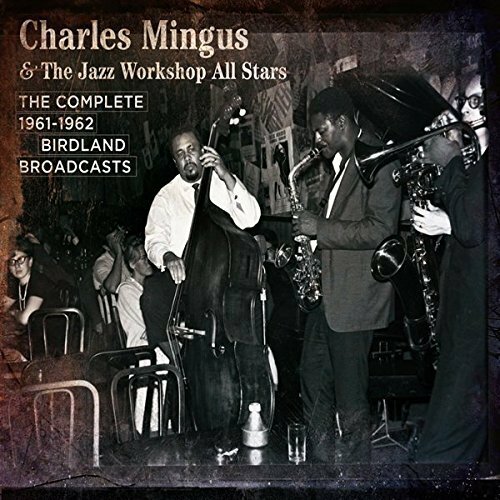 Charles Mingus(bass, piano); Booker Ervin(tenor sax); Rahsaan Roland Kirk(tenor sax, manzello, stritch); Yusef Lateef(tenor, flute); Charles McPherson(alto sax, tenor sax); Richard Williams(trumpet); Edward Armour(trumpet, flugelhorn); Jimmy Knepper(trombone); Pepper Adams(baritone sax); Don Butterfield(tuba); Jaki Byard(piano); Toshiko Akiyoshi (piano) Doug Watkins, Henry Grimes, Herman Wright(bass) & Dannie Richmond(drums). Birdland on October 21, 1961; March 24 & 31, 1962; May 5 & 12, 1962 and October 19 & 26, 1962. This is a fiesta of great Mingus music recorded when he was at one of his many peaks. The rough edged, sweaty, energetic, passionate music sometimes sounds half formed but that apparent lack of precision gave it a humanity. At times the music seems to be in opposition to the music from the west coast which in the early sixties had lost its way, promoting politeness over passion, precision over individuality. This was the period when Mingus was going into the studios to record what has turned out to be some of his major works. Some of the music heard here was on the 'Oh Yeah' album recorded in November 6, 1961 including 'Eat That Chicken'(7 versions! ); 'Hog Callin' Blues'; 'Devil Woman'; 'Ecclusiastics'; 'Oh Lord Don't Let Them Drop That Atomic Bomb On Me' and 'Peggy's Blue Skylight'. The music is taken from nightclub performances at Birdland by various Mingus groups from October 1961 to October 1962. They are not professionally recorded, in fact recorded from the radio, with the defects that you would expect from an off-air recording from that era. The music is listenable, and because of its quality, enjoyable. There are many highlights. ‘Ysabel’s Table Dance’ is by the group which does not include Danny Richmond. The group that night was Toshiko Akiyoshi, and Henry Grimes as a second bass player. Booker Ervin is on tenor, and Richard Williams is on trumpet. This group also gives an almost definitive reading of ‘Peggy's Blue Skylight’. The group on Disc 3 has a fuller sound with the obscure trumpeter Ed Armour, the tuba player Don Butterfield and baritone saxophonist Pepper Adams. Dannie Richmond is present on all the other tracks and you have a chance to realise what an influence he was on the music of Mingus. Tony Williams with Miles Davis is often credited with commanding the rhythmic pulse in the Davis group. Richmond dominates the pulse throughout. You can enjoy these three CDs just listening to Richmond. Jaki Byard is as subversive and wide ranging as ever across the three CDs. Just listen to his solo on ‘Fables of Faubus’ on the first disc. It is a solo that is pure idiosyncrasy. Was there ever a better pianist for Mingus? He switches gear completely when he takes the band into ‘Eat That Chicken’. Glorious lift-the-spirit-music.